MFA and AIMA generally support portions of the Proposed Rule but take strong exception to certain aspects of it. Although we acknowledge the Commission’s investor protection concerns regarding the use of derivatives by mutual funds and other registered investment companies, we question whether it is necessary to redefine and then regulate derivatives as ‘senior securities’ under Section 18 of the 1940 Act. We also have serious concerns that the Proposed Rule’s notional-based leverage limits are too blunt a risk mitigation tool for most derivatives used by funds. Despite our concerns, we generally support the Commission’s activities-based approach in providing an updated and more comprehensive framework to regulate funds’ use of derivatives. As summarised below, we agree with several key aspects of the Proposed Rule, including requirements as to: asset segregation, a formalised derivatives risk management program (a ‘DRM Program’), and recordkeeping. In our view, these key pillars of the Proposed Rule render the imposition of any new notional-based limit unnecessary and inappropriate to address the policy objectives of Section 18 of the 1940 Act. More specifically, we believe the proposed asset segregation requirements would function as an effective leverage limit on funds’ use of derivatives as well as ensure funds’ ability to meet their payment obligations stemming from derivatives transactions. The combined effect of the DRM program and the proposed recordkeeping requirements would reinforce and support the proper application of the proposed asset segregation requirements. We are fundamentally concerned with the Commission’s view in the Proposed Rule that derivatives transactions entered into by a fund, in compliance with the SEC’s long-standing policy and staff no-action guidance on asset segregation, should now be considered ‘senior securities’ under Section 18 and, in turn, become subject to the substantial conditions and restrictions in the Proposed Rule. In our view, the Commission’s sudden proposed reversal of its long-established policy on the treatment of derivatives under Section 18 of the 1940 Act lacks sufficient justification. However, if the Commission proceeds with redefining derivatives transactions as senior securities in a final rule, we agree with the Commission’s view in the Proposed Rule that a derivative that does not impose a future payment obligation on a fund would not involve a senior security transaction for purposes of Section 18 of the 1940 Act, because there would be no evidence of indebtedness. In addition to our threshold policy concerns, we have serious concerns with the Proposed Rule’s alternative notional-based leverage limits. We believe such an overall leverage limit is both unnecessary and inappropriate because it lacks sufficient justification, given the practical effect of the Commission’s proposed asset segregation requirements and the potential reinforcing effect of the Commission’s other related regulations after their adoption. We note additionally that the notional-based limits are too insensitive to risk to be effective tools for gauging a permissible level of risk and leverage. If the Commission does proceed with adopting leverage limits and certain other aspects of the Proposed Rule, we respectfully urge the Commission to consider our proposed recommendations for modifications to the final rule. We suggest that the Commission’s policy objective to protect investors would be well-served by establishing a better balance between authorising funds to use derivatives for hedging, risk-mitigation and investment purposes, and imposing reasonable, practical restrictions that address the risks derivatives may present to funds and their investors. We explain why we believe that the notional-based exposure limitation is unjustified and why we believe that a risk-based coverage amount and the mark-to-market coverage amount would be sufficient on their own. More specifically, we believe that a fund’s board should be authorised to base the proposed risk-based coverage amount on no less than the required initial margin for each of the derivatives transactions in the fund’s portfolio. We suggest that the Commission provide managed futures funds with the option to use a margin-based approach in lieu of both a notional-based limit and the risk-based coverage amount, pursuant to which the fund would segregate on its books and records an amount equal to, and in addition to, the initial margin requirement that the fund is otherwise required to satisfy in respect of each of its derivatives transactions. Alternatively, should the Commission proceed with adopting a notional-based exposure limitation in its final rule, we recommend that such limits be subject to certain risk-based adjustments or notional exposure ‘haircuts' based on the asset class of the derivatives transaction. We believe that such haircuts, together with a modified value-at-risk (VaR) test, would account more effectively for the risk of the underlying asset class and reflect more accurately the actual risk of the derivatives transaction. We recommend that, if the Commission decides to adopt a notional-based exposure limit, the Commission authorise funds to recalculate their notional-based exposures and applicable portfolio and securities VaR limits at the end of each business day, consistent with the timing standard for asset segregation, rather than on an immediate basis with respect to each of the multiple derivatives transactions that a fund may enter into throughout the trading day. We also recommend that, for purposes of netting notional amounts to calculate derivatives exposure, funds should have the flexibility to determine which types of derivatives transactions may properly offset other derivatives transactions. We further recommend that if the Commission retains a notional-based approach, the exposure-based limit and the risk-based limit should be increased and subject to our recommended risk-based adjustments. While we agree with the Commission’s approach to asset segregation, we are concerned with the Proposed Rule’s limitation of qualifying coverage assets for derivatives transactions to cash and cash equivalents. Such a limitation could lead to potential adverse consequences, such as a ‘cash drag’ on funds and resulting strains on the availability of sufficient cash equivalents for Funds. To avoid these adverse consequences, we request that the rule permit funds to use a broader scope of liquid assets with appropriate haircuts. We support the use of variation margin and initial margin posted by a fund in connection with a derivatives transaction as an appropriate reduction to the amounts a fund would be required to segregate under the Proposed Rule. We appreciate the Commission’s proposal to authorise a fund to calculate the proposed segregation amounts on a net basis for derivative transactions, i.e., subject to netting agreements that allow for payment obligations to be netted across multiple transactions. However, we believe that the Commission also should authorise netting across different counterparties, which is consistent with prior long-standing Commission guidance that funds have been relying on without incident. We generally support the Proposed Rule’s written derivatives risk management program requirements to provide protective benefits to funds and their shareholders. We also support the adoption of the recordkeeping provisions in the Proposed Rule. Private investment funds have long used a diverse array of alternative investment strategies involving the use of derivatives to generate returns and protect against losses in all market conditions and environments. While no strategy is perfect in all market conditions, many of these strategies provided substantial benefits to investors during the global financial crisis from November 2007 to February 2009. 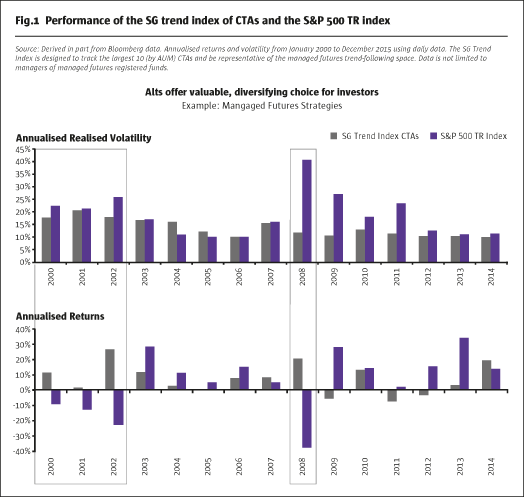 When measured against global equity indices, for example, alternative strategy funds were able to mitigate losses during this period of unprecedented market volatility. 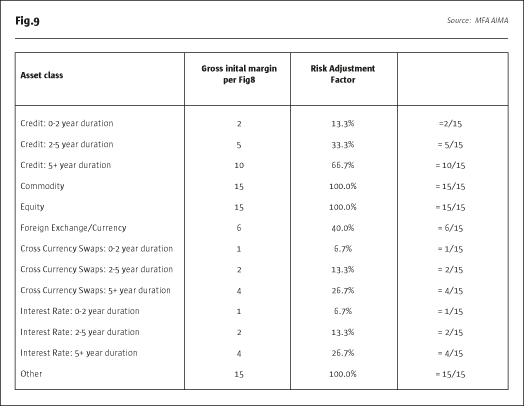 As shown in Fig.1, managed futures strategies,in particular, performed particularly well during the financial crisis, in many instances providing positive returns while global equities suffered extensive losses. In recent years, increased investor demand has resulted in private fund managers offering alternative strategies through regulated investment vehicles that are readily available to non-accredited investors. Both institutional and retail investors have increasingly sought the non-correlated returns of alternative strategies,while also benefiting from the increased liquidity, transparency, diversification and regulatory oversight that come with mutual funds and other types of regulated investment funds. Investment allocations to alternative funds registered under the 1940 Act have grown dramatically since the financial crisis, with recent research indicating that the amount of assets in alternative strategy mutual funds has tripled between 2009 and 2014, growing from $58 billion to $170 billion. Registered investment vehicles use derivatives for a variety of risk-reducing and other beneficial purposes, including achieving greater transaction efficiencies and accessing certain markets that may not otherwise be available through traditional investment strategies. Derivatives also allow registered funds to hedge or mitigate interest rate, foreign exchange and other portfolio risk, as well as to obtain investment leverage. Derivatives are also frequently used to manage the liquidity of portfolios. Many securities and other direct holdings are less liquid than their derivative counterparts, so prudent portfolio construction in line with the liquidity constraints imposed under the 1940 Act often result in registered funds using derivatives, rather than cash. Derivatives regulation that has the effect of driving funds to move toward less liquid cash alternatives could run counter to some of the liquidity risk management practices the SEC has proposed. 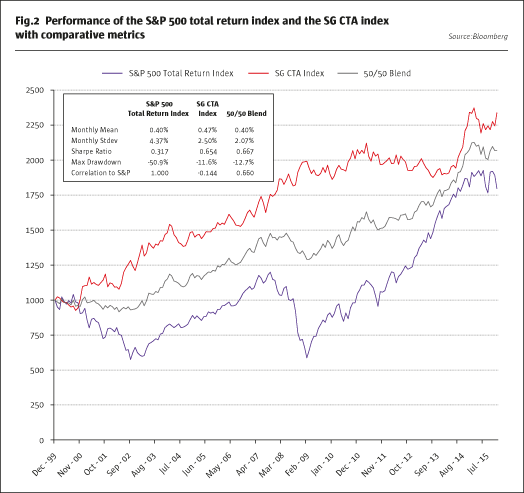 Fig.2 highlights the benefits of alternative mutual fund strategies by comparing the performance of the S&P 500 Total Return Index to the SG CTA Index over the past 15 years, as well as a 50/50 blend. We appreciate that funds are designed to be retail products, and as a result often have a different investor base than that of private funds. We also acknowledge the Commission’s policy objective to protect investors from the potential risks of leverage from funds’ use of derivatives. However, if adopted without modification, we are concerned that the notional-based portfolio limits and certain other aspects of the Proposed Rule will limit investor choice needlessly. We also believe that the proposed limitations lack sufficient justification under the Commission’s rulemaking standards. The Proposed Rule’s portfolio limits alone could have a much broader impact on the US mutual fund industry than presented by the study conducted by the Commission’s Division of Economic and Risk Analysis (DERA). We believe the disproportionate impact on alternative funds and the broader impact on other mutual funds provide a compelling reason for the Commission’s reconsideration of the Proposed Rule’s portfolio limits under its rulemaking standards. A rulemaking that imposes unjustified portfolio limitations would deprive retail investors, as well as institutional investors that prefer investing in more regulated products, of investment choice and the benefits of mutual fund strategies that use derivatives. An additional unintended consequence of the Proposed Rule may be that some funds would cease using certain derivatives in their strategies, resulting in less diversified investment portfolios for their investors. These outcomes would arguably undermine investor protection, and may stifle efficiency, competition and capital formation in the US mutual fund markets. In our view, we believe that the SEC needs to more clearly demonstrate that the Proposed Rule, and in particular, the proposed portfolio limitations, would have mitigated previous problems caused by funds’ use of derivatives, or would solve for anticipated problems caused by their use of derivatives. As we explain below, we do not believe that either the record of the past 40 years or any reasonably foreseeable circumstances exist to warrant such changes. Indeed, a decision by the Commission to adopt a rule that could cause a portion of the mutual fund industry to cease offering strategies that use derivatives to retail and institutional investors, or to cease their operations altogether, demands clear rulemaking justification. For the reasons we explain below, we are primarily concerned with the Proposed Rule’s new limits on aggregate derivatives notional exposure. The Proposed Rule would require funds engaging in derivatives transactions to comply with one of two portfolio limitations immediately after entering into each derivatives transaction. Under the first limit, referred to as an ‘exposure-based portfolio limit’, the aggregate exposure of a fund may not exceed 150% of the value of its net assets. ‘Exposure’ would mean, in relevant part, the aggregate notional amounts of the fund’s derivatives transactions. The notional amount under the Proposed Rule would be defined generally as the market value of an equivalent position in the underlying reference asset, or the specified or principal amount on which payment obligations under a derivatives transaction are calculated. For purposes of calculating exposure, a fund would be permitted to net any directly offsetting derivatives transactions that are the same type of instrument and have the same underlying reference asset, maturity and other material terms. Funds could net substantially similar transactions across different counterparties. Under the second limit, referred to as the ‘risk-based portfolio limit’, a fund’s permitted exposure could increase to 300% of net assets if its derivatives exposure reduces the fund’s exposure to market risk. The Proposed Rule would permit a fund to maintain the 300% notional exposure if the VaR of a fund’s portfolio inclusive of derivatives transactions were less than the VaR of the portfolio without any derivatives. As the Proposed Rule states, a fund’s VaR is an estimate of potential losses on an instrument or portfolio, expressed as a positive amount in US dollars, over a specified time horizon and at a given confidence level, subject to certain minimum requirements for the VaR analysis. The netting concepts noted with respect to the exposure-based portfolio limit also would apply to the risk-based portfolio limit. The Proposing Release does not explain clearly how the Commission determined the 150% exposure-based portfolio limit or the 300% risk-based portfolio limit as the appropriate limits. Based on our reading of the examples on page 80909 of the Proposing Release, we understand that the 150% and 300% limits would authorise a fund to have gross exposure limits of 250% and 400%, respectively, consisting of 100% direct exposure and 150% and 300% notional exposure, respectively. Based on the ICI survey results showing a broader impact of the proposed limits, we believe the exposure-based portfolio limit and risk-based portfolio limit are unworkable and, without the risk adjustments we discuss below, would cause a significant percentage of funds to adjust their investment strategies or to de-register, potentially to the detriment of investors. Section 18 imposes various requirements on the capital structure of funds and governs the extent to which a fund may issue senior securities. The requirements are intended to prevent: (i) potential abuse by the purchasers of senior securities, (ii) excessive borrowing and issuance of senior securities by funds and (iii) funds from operating without adequate assets and reserves to meet their obligations. The Proposed Rule would reverse the Commission’s long-standing guidance that derivatives, properly covered by a fund in compliance with this guidance, are not treated as senior securities for purposes of Section 18 of the 1940 Act. Beginning with Investment Company Act Release No. 10666, issued in 1979 (‘Release 10666’) and continuing in a series of subsequent no-action letters, the Commission and its staff interpreted Section 18 and developed a ‘segregated account approach’, which requires a fund to segregate liquid assets sufficient to meet potential obligations arising from, or to enter into offsetting positions against, the fund’s investment in certain types of instruments, including reverse repurchase agreements, firm commitment agreements and standby commitment agreements. The Commission has taken the position that derivatives may raise senior securities issues under Section 18 and would be subject to this asset segregation approach. However, through a series of no-action letters, the Commission’s staff has taken the position that these transactions would not be senior securities if funds were to ‘cover’ their obligations under the instruments or enter into offsetting positions, consistent with Commission guidance. In Release 10666, the Commission explicitly confirmed the position of the Division of Investment Management in the form of a formal General Statement of Policy. Following the Commission’s issuance of Release 10666, the Commission staff issued more than 20 no-action letters to funds related to the maintenance of segregated accounts or otherwise covering their obligations in connection with various derivatives transactions, including interest rate futures, equity index futures and related options. In the Dreyfus Letter, Commission staff stated that, in respect of the derivatives transactions entered into by the funds, “[w]e agree that, if a fund meets the segregation requirements, a ‘senior security’ would not be present and, therefore, the 300% asset-coverage requirement of Section 18(f) would not apply” (emphasis added). In 1995, Commission staff again addressed the issue in the context of short sales, stating that if the funds segregated an amount that, when combined with the amount deposited with their broker as collateral, is equal to the ‘current’ market value of the underlying instrument as it varies over time, there would be no senior security concerns related to the transaction. In a 1996 letter issued to Merrill Lynch Asset Management, Commission staff again addressed the matter by issuing relief to a fund engaged in derivatives trading, stating the staff would not recommend enforcement under Section 18 provided the “[f]und covers its obligations that may otherwise be deemed to be senior securities…” (emphasis added). In 2011, the SEC set forth its asset segregation approach to derivatives under Section 18 of the 1940 Act in the Concept Release. Accordingly, it is well-settled under both the actions of the Commission itself and of the staff, that when a fund complies with the segregation requirements, the Section 18 senior securities concept does not apply to derivatives transactions. The newly-proposed imposition of notional limits would be a significant departure from nearly 40 years of Commission guidance and no-action letter relief. We are unaware of any material event or occurrence, or series of events oroccurrences, related to the use of derivatives by funds to justify the SEC’s reversal of this long-standing policy. In the Proposing Release, the SEC identifies two affiliated mutual funds that invested in total return swap contracts and suffered extensive losses in 2008. The SEC also identifies two closed-end funds and a private fund that also suffered losses in part from derivatives. We respectfully disagree that the losses suffered by these three funds’ investors in the midst of a global financial crisis justify sufficiently the reversal of four decades of established SEC policy. The 1940 Act and the rules and regulations thereunder have historically not been, and should not now be construed as, the basis for establishing investor suitability standards and determinations. We respectfully suggest that the Commission should authorise funds’ boards to base the ‘risk-based coverage amount’ on a fund’s initial margin requirements for its derivatives transactions to enhance the functional leverage limit that we believe the Proposed Rule’s asset segregation requirements would provide. Moreover, we believe that such an approach would make the asset segregation requirements sufficiently robust that an additional notional-based exposure limit should not be necessary. The Proposed Rule would require a fund to segregate daily on its books and records cash and cash equivalents as ‘qualifying coverage assets’ for derivatives transactions. Such qualifying coverage assets would be equal to the sum of a ‘mark-to-market coverage amount’ which reflects the fund’s net obligations if the fund exited its derivatives positions on such day, plus a ‘risk-based coverage amount’ which is designed to capture additional losses the fund would suffer if it exited its derivatives transactions under stressed market conditions. 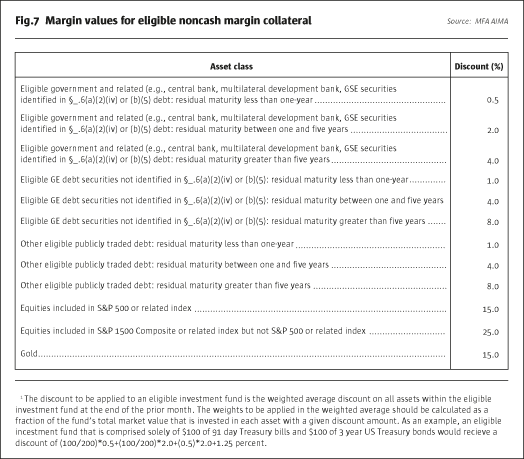 The mark-to-market coverage amount would be reduced by the value of variation margin. Variation margin could not reduce the fund’s mark-to-market coverage amount for other transactions except as otherwise permitted under a netting agreement. The risk-based coverage amount would be reduced by initial margin, but only for the specific transaction for which the fund posted initial margin. We support the use of both a mark-to-market and risk-based approach to asset segregation. We believe the daily segregation requirement is a reasonable and appropriate restriction on a fund’s ability to use derivatives transactions. The mark-to-market approach is also largely consistent with the Commission’s prior guidance in Release 10666, which requires a fund to segregate assets – dollar-for-dollar – against the fund’s outstanding liabilities in respect of reverse repurchase agreements, firm commitment agreements and standby commitment agreements. We also support the SEC’s proposal that initial and variation margin posted by a fund in connection with a derivatives transaction should further reduce the risk-based coverage amount and mark-to-market coverage amount, respectively, for such transaction. The Commission seeks comment on how the risk-based coverage amount should be calculated, while listing several alternative methods for consideration such as specifying a percentage of the derivative’s notional value or basing it expressly on initial margin requirements. We believe a fund should be authorised, pursuant to board-approved policies and procedures, to determine the risk-based coverage amount by using a minimum threshold amount equal to the initial margin requirement for each derivatives transaction. As we demonstrate below, the initial margin required to be posted by a fund in connection with its derivatives transactions more accurately reflects the risks associated with such trades than the notional amount. Across a variety of futures contracts, in particular fixed income, a notional approach significantly overstates the risk of the contract. Fig.3 highlights the flaws in using a notional approach to quantify and regulate leverage, primarily because it bears little relationship to and is a poor proxy for risk. Fig.3 shows these flaws visually by presenting a scatterplot of notional value versus VaR for 31 futures contracts across the four major sectors of commodity, fixed income, equity and currency. 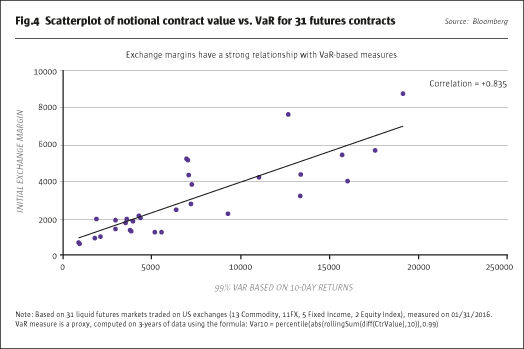 However, as shown below in Fig.4, when exchange initial margins are compared to VaR for the same representative futures contracts, there is a strong and meaningful relationship. Even inside a sector, we note that there is no reliable relationship between notional contract value and either exchange initial margin or VaR. As shown in Fig.5, which covers US Treasury instruments ranging in maturity from two years to 30 years, there is significant variation as the initial margin and VaR increase with the maturity of the instrument. Our concerns with notional amount as an accurate measure of risk are further highlighted in Fig.6. 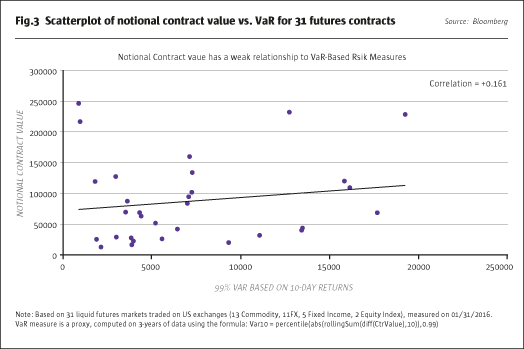 Even with regard to one futures contract in isolation, as the absolute price of the contract, and therefore its notional value changes over time, its risk may bear little or no relationship to its notional value. 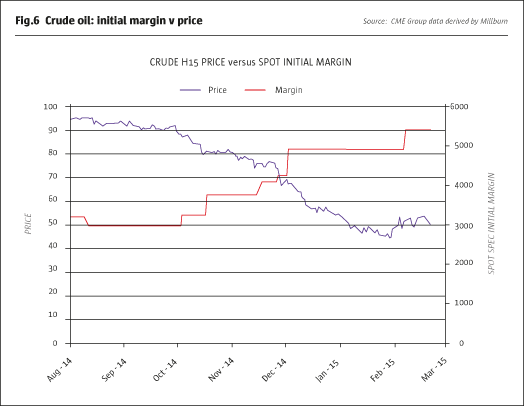 As can be seen in Fig.6, which shows the price of crude oil from August 2014 through March 2015, the exchange (NYMEX – CME Group) initial margin for the spot contract, based on its assessment of risk, increased as the price decreased, the opposite of what would happen with notional value as a measure of risk. Based on our demonstrable concerns with notional amount as an accurate measure of risk, we suggest that authorising a fund to determine the risk-based coverage amount based on required initial margin would be a more accurate measure of risk that would allow a fund to ensure that it has segregated sufficient assets to cover any potential costs the fund might incur if it were to exit the derivatives transaction under stressed conditions. For futures contracts and other exchange-traded derivatives, margin amounts are determined and continuously reviewed by the exchanges and clearinghouses and are adjusted to reflect risk. We believe that a risk-based coverage amount that is based on mandatory initial margin, combined with the mark-to market asset segregation requirements proposed by the Commission, would provide a fund with the flexibility needed to manage its portfolio, yet effectively address the concerns of the Commission regarding a fund’s derivatives activity and the related risk to investors. The Proposed Rule would permit a fund to calculate the mark-to-market coverage amount and risk-based coverage amount on a net basis for those derivative transactions for which the fund has entered into a netting agreement that allows netting of payment obligations across multiple derivatives transactions. We appreciate and support thisbeneficial use of netting arrangements and request that the Commission clarify that the netting provisions in standard industry documentation, such as the 1992 or 2002 ISDA Master Agreement, constitute a ‘netting agreement’ for purposes of the Proposed Rule. However, unlike the broader scope of netting permitted for the calculation of notional exposure under the Proposed Rule, the requirement of a netting agreement for purposes of calculating the coverage amounts effectively prevents netting across different counterparties. We believe that netting exposures across different counterparties – consistent with SEC guidance since the 1987 Dreyfus Letter – should be available to funds calculating either coverage amount. In our view, funds should have some flexibility under their respective analyses of counterparty credit risk to determine which types of derivatives transactions may properly offset other derivatives transactions to achieve risk reduction. While the Commission has not explained the rationale for prohibiting cross-counterparty netting in the Proposed Rule, we understand that Commission staff members have expressed concerns about counterparty credit risk during fund audits and inspections. We note that there are ample protections afforded to funds that would justify cross-counterparty netting. First, funds regularly engage in the same counterparty risk analysis with offsetting derivatives transactions as they do when considering initially to enter into a derivatives transaction with a counterparty. Second, many funds enter into exchange-traded derivatives guaranteed by a clearinghouse that are subject to daily margining. Third, for non-cleared OTC derivatives, funds typically enter into credit support documents requiring daily, mark-to-market margining. In addition, the final margin rules adopted by other regulators will soon require mandatory minimum initial and variation margin exchange for non-cleared OTC swaps. Fourth, funds and their boards typically have counterparty credit review procedures for the implementation and ongoing monitoring of these counterparty relationships. Given these protections afforded to funds, we respectfully urge the Commission to authorise funds to net exposures across counterparties for purposes of calculating both the risk-based coverage amount and mark-to-market coverage amount. Under the Proposed Rule, qualifying coverage assets for derivatives transactions would generally be restricted to cash and cash equivalents. The Commission requests comment on whether a fund should be permitted to segregate other types of assets. We strongly believe so. Limiting qualifying coverage assets to cash and cash equivalents is in conflict with 20 years of prior Commission policy and established market practice. The Commission’s proposed new policy is also at odds with its own proposed margin rules with respect to eligible assets available to collateralise non-cleared security-based swaps. The proposal is also at odds with comparable collateral requirements for non-cleared OTC derivatives in the final margin rules adopted by the Prudential Regulators and the CFTC as well as in the final BCBS-IOSCO Framework. Each of these regulatory bodies authorises a broader range of qualifying assets with appropriate standardised haircuts to reflect the specific risks of the relevant asset. We are also very concerned that limiting qualifying coverage assets to cash and cash equivalents would likely require funds to maintain cash investments and to under-invest in order to keep the requisite cash on hand. Funds would thus incur a ‘cash drag’ on these segregated holdings, which diminishes their abilityto diversify their portfolios, and reduces investor returns. We respectfully urge the Commission to expand the definition of qualifying coverage assets to include all liquid assets. We suggest that the Commission impose the standardised haircuts to assets that are riskier than cash as set forth in Fig.7 – ‘Margin Values for Eligible Noncash Margin Collateral’ of the PR Final Margin Rules. For the Commission’s reference, see Fig.8. Should the Commission proceed with implementing an additional portfolio limit in its final rule in addition to the risk-based coverage amount in the asset segregation requirements, we believe that a margin-based portfolio limit would be more appropriate for certain funds as opposed to a notional-based limit. So long as the qualifying coverage assets that a fund may segregate include not just cash and cash equivalents, but all liquid assets with appropriate regulatory haircuts as suggested in Section IV.2 above, we believe that a margin-based limit would allow managed futures funds to effectively manage their use of derivatives and not be forced into de-registration. Based on our demonstrable concerns with using a notional approach for leverage limits, we ask the Commission to consider providing the boards of managed futures funds with the option of instead using a margin-based approach that would be relatively simple to apply and would better address the Commission’s concerns regarding undue speculation and the need to retain adequate assets in reserve to protect investors. This approach would also address the Commission’s concerns with investor protection, while avoiding the potential unintended consequence of limiting investor options. Under our proposed margin approach, managed futures funds that use derivatives would maintain a reserve of segregated cash, cash equivalents, and/or liquid securities subject to regulatory haircuts in an amount equal to, and in addition to, the required initial margin for each derivatives transaction involved. A managed futures fund would segregate on its books and records an amount equal to the exchange initial margin for each futures contract or other exchange-traded derivatives transaction; the clearinghouse initial margin for each cleared OTC derivatives transaction that may not be exchange-traded; or in the case of non-cleared OTC derivatives, an amount equal to the initial margin required pursuant to the PR final margin rules. In each of these cases, we refer to such amount as the ‘margin assets’. For example, if a managed futures fund were to purchase a derivatives contract that requires $100 initial margin to be posted with its futures commission merchant (FCM), under our approach the fund would post $100 to its FCM and then segregate on its books and records an additional $100 in connection with such derivatives contract. In our view, the use of segregated margin assets by managed futures funds would function as an enhanced asset coverage test that would both reinforce the Commission’s proposed asset segregation requirements and address the Commission’s concerns with the insufficiency of mark-to-market segregation alone for limiting a fund’s leverage from the use of derivatives transactions. We do note, however, that funds which adhere to different strategies may not possess sufficient assets in order to segregate such additional amounts. Accordingly, we propose it as a realistic and workable alternative approach for the investment strategies of managed futures funds only, provided that the final rule permits such funds to use an expanded scope of qualifying coverage assets beyond cash and cash equivalents. In our view, a margin-based approach that would require the segregation of an amount equal to required initial margin would have many of the same advantages and benefits discussed above with respect to using the mandatory initial margin amount as a basis for calculating the risk-based coverage amount. If the Commission decides to proceed with implementing some form of notional-based exposure limits, we ask the Commission to subject these limits to certain risk adjustments based on the type of the derivatives transactions into which the fund enters. Application of risk adjustments to notional exposure would achieve more accurate measures of derivatives exposure and would be relatively easy to calculate across all funds, regardless of strategy. Without appropriate risk adjustments, a straight notional test would encourage funds to concentrate their portfolios in derivatives transactions with the highest levels of risk per notional dollar and decrease a portfolio manager’s ability to offer a diversified portfolio across market sectors. In application, we fear that a straight notional test could have unintended adverse effects on the attainment of the Commission’s policy goals to enhance investor protection and asset sufficiency. We respectfully urge the Commission to authorise funds’ use of notional risk adjustments in the final rule as a prudent risk management practice. Based on these concerns, we suggest risk adjustments to notional exposure in response to the Commission’s request for comment on whether there are other appropriate adjustments for determining a fund’s exposure to certain derivatives, such as Euribor and Eurodollar futures, that the Commission should consider to avoid overstating a fund’s derivatives investment exposure. We believe that if the Commission adopts a notional limit, the calculation of notional exposure for a wide variety of derivatives transactions, and particularly fixed-income derivatives, throughout the Proposed Rule should be subject to certain risk-adjustment factors or notional exposure ‘haircuts’ to more appropriately address the specific risks arising from each underlying asset class. We refer to this adjusted notional exposure calculation as the 'risk-adjusted exposure'. We recommend that the calculation of the risk-adjusted exposure be based on the initial margin requirements of the PR final margin rules. Using the PR final margin rules provides an attractive approach in this context that would be subject to less discretion for interpretation, reducing possible market manipulation or abuse. A fund’s risk-adjusted exposure would be equal to the notional amount of a particular derivatives transaction multiplied by a risk-adjustment factor derived from the Prudential Regulators’ – ‘Standardized Minimum Gross Initial Margin Requirements For Non-Cleared Swaps and Non-Cleared Security-Based Swaps’ of the PR final margin rules, see Fig.8. We suggest using equities and commodities as a baseline for determining haircuts for the other asset classes, as the Prudential Regulators identified equities and commodities as the riskiest assets in their schedule of eligible collateral, as outlined in Fig.9. Gross initial margin for a non-cleared swap referencing commodities or a portfolio of equities is 15% of notional exposure. For purposes of determining the risk-adjusted exposure for a fund’s portfolio, the notional amounts of derivatives referencing equities or commoditieswould receive no notional exposure haircut and would attract a 100% risk-weighting. The notional amounts of derivatives referencing other assets presenting less risk would accordingly receive smaller risk-weightings, as a percentage of the risk presented by equities or commodities. For example, a fund’s non-cleared swap referencing credit with a duration of up to two years would require 2% gross initial margin. We would determine the appropriate risk-adjustment factor for this swap by dividing 2 by 15, resulting in a 13.3% risk-adjustment factor. A $100 million notional swap referencing credit with a two-year duration would have a risk-adjusted exposure of $13,300,000. Each derivatives transaction that the fund enters into would receive a risk-weighting through the same basic calculation. If the Commission is going to adopt a notional leverage limit model, we recommend this approach because it more accurately identifies and calculates the particular risks raised by derivatives referencing a wide variety of assets. Our suggested approach is based on asset-specific risk analyses for derivatives that have been studied and adopted by the Prudential Regulators, the CFTC, as well as the SEC in its related proposed rule. These percentages also correspond with those in the BCBS-IOSCO Framework that established minimum standards for margin requirements for non-centrally cleared derivatives. Moreover, the calculations are relatively simple to perform and not subject to discretionary input from a fund, its board, or its manager. The Commission also requested comment on whether it should consider requiring or permitting the notional amounts for interest rate futures and swaps to be adjusted so that they are calculated in terms of 10-year bond equivalents. We support this alternative risk-adjustment method and believe that the Commission should authorise this alternative option for funds in calculating their exposures with respect to both bond and interest rate derivatives. For example, we would determine the adjusted notional exposure for a three month Eurodollar contract with a $1,000,000 notional amount by dividing the contract duration in months by the 10-year duration in months and multiplying that quotient by the contract notional amount, as follows: $1,000,000 * (3/120) = $25,000. The result would be an adjusted notional exposure of $25,000, as opposed to $1,000,000. We believe this result would provide a better and more accurate assessment of a fund’s exposure to interest rate risk, as the full notional exposure of such derivative significantly overstates the fund’s actual exposure. Moreover, authorising this risk-adjustment method is consistent with the SEC’s Form PF, which provides for the calculation of exposures of interest rate derivatives in terms of the 10-year equivalent duration-adjusted value for such positions. The Commission also requests comment on whether the netting provision for calculating a fund’s exposure is appropriate. While we appreciate the ability to net offsetting derivatives transactions in proposed Rule 18f-4(c)(3)(i), we believe the restriction on netting only directly offsetting transactions that are the same type of instrument is too limited and should be eliminated. Funds should have flexibility to determine which types of derivatives transactions that have the same material terms may properly offset other derivatives transactions, for example, a futures contract to offset an option, if such offset reduces market risk. A fund would adopt policies and procedures to ensure that such offsets are reasonably equivalent. To the extent that the Commission adopts a notional-based portfolio limit, we would also recommend modifying the conditions that would authorise a fund to maintain up to 300% notional exposure under the fund, subject to the risk adjustments to the notional amountsof derivatives transactions by asset class, as described above in Section VI. In our view, the risk-based portfolio limit, as proposed, would not be a viable alternative limit for most funds. Funds generally do not use derivatives exclusively for risk-mitigation, but seek to obtain exposure in a more cost-effective way than by a direct investment in the underlying assets of a derivatives transaction. For these reasons, we respectfully ask the Commission to consider modifying the conditions under which a fund may adhere to the risk-based portfolio limit and instead impose an absolute portfolio VaR limit of 20% of a fund’s net asset value in order to qualify for the Commission’s 300% risk-based portfolio limit. A fund’s portfolio VaR would have to be less than 20% of its net asset value after entering into a derivatives transaction in order for the fund to increase its derivatives exposure up to the 300% limit. We believe an absolute VaR test would incentivise funds to maintain risk control by virtue of the absolute 20% limit. Our proposed absolute VaR test would be subject to SEC-approved parameters that would require a fund to use a minimum 99% confidence interval, a time horizon of 20 trading days, and a minimum of three years of historical data. SEC-approved parameters for the absolute VaR test would provide consistency across funds, regardless of strategy, to facilitate the SEC staff’s compliance oversight and enforcement. As an additional benefit, an absolute VaR test would subject a fund’s portfolio to both a limit on VaR with a 20% cap and on risk-adjusted exposure by preserving the 300% cap. We believe the imposition of such hard limits would be easier for the Commission’s staff to administer and enforce, and would be less prone to interpretation and potential manipulation. As an alternative to a 20% limit, we note that mutual funds and exchange-traded funds that track the S&P 500 Index have long been a popular choice for retail and institutional investors. To our knowledge, the SEC has not expressed concerns over the risks posed to investors from S&P 500 Index funds. Accordingly, we suggest that the Commission consider imposing a VaR limit that corresponds to the VaR for S&P 500 Index Funds. We believe that a fund that limits its use of derivatives to a level of risk that is comparable to the level of risk presented by a basic S&P 500 Index fund does not present undue risk to investors. If the Commission determines not to authorise an absolute VaR test, we suggest an alternative that would permit a fund to maintain up to 300% notional exposure if the VaR at this level did not exceed the VaR at the 150% level. Under this alternative VaR test, a fund would compare the VaR of its total portfolio with the VaR of a subset portfolio that includes securities and derivatives exposure of up to 150% exposure. A fund’s use of derivatives in excess of 150% must be risk reducing to the fund’s portfolio in order for the fund to qualify for the higher 300% limit. We refer to this as the ‘modified VaR test’. Under the Proposed Rule, a fund could maintain an aggregate exposure up to 150% of its net assets regardless of its VaR. To the extent that the Commission adopts a notional-based portfolio limit, under the modified VaR test a fund could obtain up to 150% exposure (subject to the risk adjustments to notional amounts of derivatives by asset class, as described above in Section VI), and then become subject to the 300% limit on an exposure amount in excess of 150%. We believe it would be reasonable for the Commission to authorise a fund to maintain exposure of up to 300%, but only if the fund’s VaR does not exceed the VaR at 150%. Requiring a fund to determine whether the VaR of its portfolio would increase or decrease as a result of any derivatives exposure added to its portfolio in excess of the exposure-based portfolio limit would act as an incentive for risk reduction beyond the 150% level. A fund would applythe modified VaR test in a consistent manner to both portfolios, while preserving both the Commission’s 150% exposure-based portfolio limit and the 300% risk-based portfolio limit. The Commission has requested comment on whether requiring a fund to comply with the Proposed Rule’s portfolio limitations immediately after entering into any senior securities transaction poses any operational challenges. If the Commission decides to adopt a notional-based exposure limit, we recommend that funds be permitted to recalculate their notional-based exposures and applicable portfolio and securities VaR at the end of each business day, as the Proposed Rule provides for determining a fund’s compliance with its asset segregation requirements. Considering the frequency with which many funds enter into derivatives on a daily basis, performing this exercise throughout a trading day would be operationally challenging, if not impossible, for many funds. In response to the Commission’s comment request,we suggest that the Commission provide funds with a 30-day grace period, as the Commission suggests,to cure a breach of the applicable portfolio limit should such a breach unintentionally occur. A grace period would provide funds the opportunity to liquidate or unwind from transactions in a responsible manner in order to comply with the applicable exposure limit and to minimise potential for forced portfolio liquidations as funds are closed down, which could ultimately result in unwarranted harm to investors. Despite our concerns with the need and justification for the proposed portfolio limitations and the narrow scope of qualifying coverage assets, we generally support other aspects of the Proposed Rule. In particular, we support the Proposed Rule’s requirement for a fund to adopt a written DRM program unless the fund complies with prescribed limitations on its use of derivatives, as discussed below. A fund’s DRM program would consist of written policies and procedures reasonably designed to, among other things, assess and manage risks associated with its derivatives transactions, including leverage, market, counterparty, liquidity and operational risks. The Commission believes that this requirement would serve to establish a standardised level of risk management for applicable funds. We agree with the Commission that to the extent DRM programs result in more robust monitoring of the risks related to derivatives, the DRM programs may reduce the risk of a fund suffering unexpected losses. We further agree with the Commission that DRM programs may also reduce adverse repercussions for others in the market, such as fund counterparties. Many fund managers have already implemented similar risk management programs that provide protection to shareholders, but we believe a standardised and consistent level of risk management for funds would provide further benefit to investors. To facilitate more efficient implementation of DRM programs by all affected funds, we ask the Commission to authorise the use of third parties to administer funds’ DRM programs. The Proposed Rule would require a fund to adopt a DRM program unless the fund complies, and monitors compliance, with a portfolio limitation under which: (i) immediately after entering into any derivatives transaction, the aggregate exposure associated with the fund’s derivatives transactions does not exceed 50% of the value of the fund’s net assets (the ‘50% Limitation’); and (ii) the fund does not enter into any complex derivatives transaction. The 50% limitation measures only derivatives transactions exposure and does not include exposure under financial commitment transactions or other transactions such as bank borrowings. We agree with the Commission’s proposal to exclude these types of senior securities transactions from the 50% limitation, because it would provide an important measure of investment flexibility for funds. We also agree that setting the threshold at 50% of the value of the fund’s net assets is reasonable given that it corresponds with the Section 18 threshold for permitted leverage in respect of bank borrowings. However, for the reasons we explained in Section VIII above, we are concerned with the proposed requirement that a fund “immediately” update its aggregate exposure, net asset value, and applicable portfolio and securities VaR. Performing this exercise throughout a trading day would be operationally challenging, if not impossible, for many funds. We believe it would be more reasonable for the Commission to require funds to perform this exercise at the end of each business day, consistent with the timing standard for asset segregation. We are also concerned that a fund may inadvertently and temporarily cross the 50% limitation during the course of a trading day. In such cases, we suggest that the final rule provide funds with a grace period of 30 days to cure the inadvertent violation. Otherwise, a temporary and inadvertent violation could trigger a fund’s required adoption of an ongoing DRM program. With respect to the complex derivatives limitation, we believe it would be reasonable for the Commission to authorise a de minimis notional exposure to a complex derivatives transaction, for example, 1% to 5% of a fund’s net asset value, before a fund would become subject to the DRM program requirements and their related implementation costs. The Proposed Rule would require a fund to maintain a written record of each determination made by its board with respect to the portfolio limitations under which the fund could operate in accordance with the Proposed Rule. Written records with respect to the initial determination of applicable limitations, as well as determinations to change such limitations, would be required to be maintained for a period of at least five years, the first two years in an easily accessible place. We support the Commission’s rulemaking efforts regarding a fund’s recordkeeping requirements, and view the inclusion of such recordkeeping provisions in the Proposed Rule as being appropriate. We agree that such records will assist both Commission staff and the fund’s own board or compliance personnel in evaluating the fund’s compliance with the final rule. We also believe the recordkeeping provisions strike an appropriate balance with respect to the recordkeeping-related burdens on a fund. The Commission seeks comment on whether providing a transition period after the effective date of the final rule would be appropriate, during which funds could continue relying on past Commission guidance. We firmly support the inclusion of a transition period of 30 months for all funds that would allow funds to come into compliance with the conditions of the final rule past its effective date. We see no reason to differentiate funds based on their size or assets under management in providing a transition period. We believe a 30-month transition period would provide funds with sufficient time to restructure their investment portfolios in a responsible and efficient manner and to develop and receive board and shareholder approvals of new investment strategies as necessary in order to ensure their compliance with the final rule’s new requirements. In addition, many funds and/or their managers will likely be required to implement significant changes to their operational and administrative infrastructure to comply with notional-based portfolio limits or any other requirements in the Proposed Rule. During the transition period, other funds may determine that they will have to de-register and thus would need the additional time to manage the complexities of that process. While we support and agree with certain provisions of the Proposed Rule, we have reservations about the Commission’s general authority to regulate the use of derivatives by funds. As discussed above, the Commission has long held the view that, provided a fund covers its obligations arising from derivatives transactions, such transactions would not be considered senior securities under Section 18 of the 1940 Act. Under the Proposed Rule, the Commission all at once rejects this long-standing policy, defines derivatives as senior securities, and by virtue of their newly-defined status, proposes substantial restrictions on their use by funds. We are very concerned that the Commission has not clearly demonstrated the justification for imposing the significant restrictions and conditions in the Proposed Rule. Funds, along with the Commission, have been operating under the less-restrictive asset segregation approach for nearly four decades with no material adverse consequences. Given the potential disproportionate impact on funds that offer alternative strategies to retail and institutional investors, we believe there are potential opportunity costs to such investors that the Commission needs to carefully consider. In our view, investor protection is undermined if the unintended consequence of the Proposed Rule, particularly its notional-based portfolio limitations on funds’ derivatives exposure, is a significant reduction in regulated, diversified investment opportunities for retail and institutional investors. Given those opportunity costs and the potential costs for restructuring or liquidating billions of dollars of funds and fund assets, we request that the Commission either re-propose its rulemaking after considering industry comments, including holding industry roundtable meetings, or provide a more comprehensive explanation of the need and justification for imposing a new notional-based limit on the use of derivatives by funds in the adopting release for the final rule. In our view, the discussion of the Proposed Rule’s quantifiable benefits and costs in the Proposing Release falls short in demonstrating meaningful benefit to investors. The Commission has requested comment on whether exposure calculations should exclude derivatives that would not generally be considered to involve senior securities, because they do not involve a future payment obligation. As discussed at the outset of this letter, we respectfully recommend that the Commission retain its well-established position that a derivatives transaction for which a fund has appropriately segregated assets should not be classified as a ‘senior security’ issued by a fund in any event. However, to the extent that the Commission does seek to reclassify derivatives involving a future payment obligation as senior securities, we strongly recommend that the Commission exclude any derivative or other similar transaction, that does not require any further payment or delivery obligation by a fund, thus lacking any evidence of indebtedness, from any notional exposure or other similar calculation under the Proposed Rule. We are also concerned that there are unintended consequences that could result from the Proposed Rule’s classification of derivatives transactions and financial commitment transactions as senior securities issued by a fund. In particular, we are concerned that deeming such transactions as securities issued by a fund could have unintended effects with respect to Section 3(c) of the 1940 Act or other provisions of the 1940 Act that use the term ‘security’, as defined in Section 2(a)(36) of the 1940 Act. We would be concerned, for example, if derivative transactions entered into by a private investment fund were deemed to impact the analysis of whether that fund could rely on one of the exclusions from the definition of ‘nvestment company’ found in Section 3(c) of the 1940 Act. We encourage the Commission to consider how best to mitigate these unintended consequences and to provide clarity that, to the extent that the Commission ultimately decides to classify derivatives transactions and financial commitment transactions as senior securities for purposes of Section 18 of the 1940 Act, any final rule will not affect provisions of the 1940 Act that are unrelated to the policy goals underlying Section 18.